UN DESA’s Development Policy and Analysis Division (DPAD) has recently launched a capacity development project, in cooperation with China, to assess the “macroeconomic implications of the Belt and Road Initiative” for the countries along the Belt and Road, in the broad context of realizing the 2030 Agenda for Sustainable Development. In a recent interview with the Xinhua News Agency at the United Nations, Pingfan Hong, Director of DPAD, analyzed the close links between the “Belt and Road” and the 2030 Agenda and shared some key points as follows. The 2030 Agenda is an unprecedentedly ambitious, universal, and overarching action plan, which has charted a sustainable development path for the world in the next 15 years and beyond. The implementation of the Agenda and the achievement of the SDGs depend critically on the concrete actions taken at global, regional, national and sub-national levels, bringing together Governments, the private sector, civil society, the United Nations system and other actors, mobilizing all available resources. In this regard, the “Belt and Road”, as a large-scaled regional development cooperation, can make important contributions to the implementation of the 2030 Agenda. 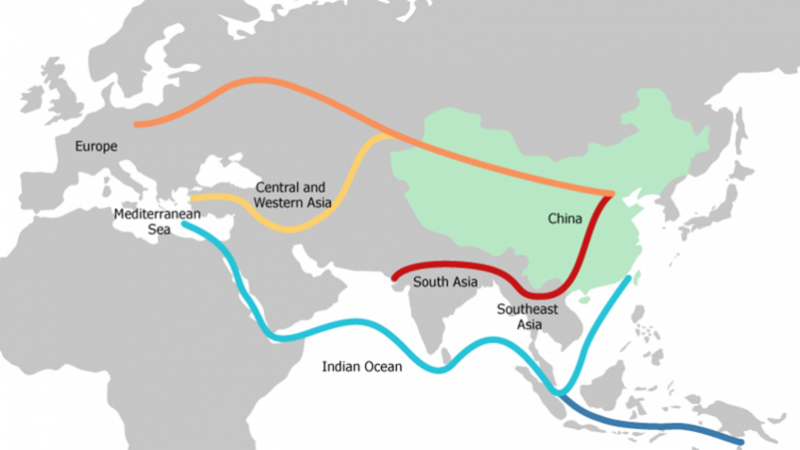 The “Belt and Road” refers to the initiative of jointly building the “Silk Road Economic Belt” and the “21stCentury Maritime Silk Road”, raised by the Government of China in 2013. This initiative has identified five priority areas for international cooperation: policy coordination, facilities connectivity, unimpeded trade, financial integration and people-to-people bond. While the “Belt and Road” and the 2030 Agenda are different in their nature and scope, they share in many respects a similar vision and some basic principles. The official document which defined the vision and action of the “Belt and Road” affirms that the initiative is in line with the purposes and principles of the UN Charter. The essential spirit of the Belt and Road to promote win-win cooperation, common development and prosperity, peace and cooperation, openness and inclusiveness, and mutual understanding and trust, conforms to the values of the 2030 Agenda. More specifically, according to a preliminary study by Pingfan Hong, the five priority areas for cooperation under the Belt and Road Initiative are found to be closely linked to the 17 SDGs and the 7 Action Areas of the Addis Ababa Action Agenda (AAAA). For example, the priority area of facilities connectivity can play crucial role in achieving the first SDG: “end poverty in all its forms everywhere”. Facilities connectivity includes improving the connectivity of infrastructure construction plans among countries along the Belt and Road; forming regional infrastructure network; and promoting green and low carbon infrastructure construction by taking into full account the impact of climate change. Economic studies have attested the importance of infrastructure investment in reducing poverty, as infrastructure investment can improve economic productivity, boost economic growth, and accelerate mobility of labour from low-productive sector to high-productive sector, leading to increase in employment and earnings for the poor. Infrastructure investment can also improve the opportunity of the poor to access to health and education, thus enhancing human development. 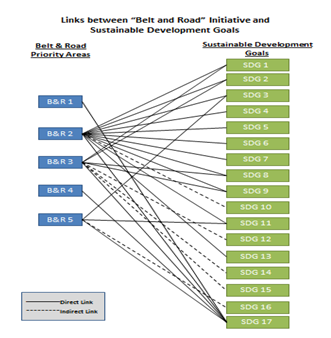 The figure displayed in this article, illustrates the overall links between the five priority areas under “Belt and Road” and the 17 SDGs. The “Belt and Road” run through the continents of Asia, Europe and Africa, directly connecting some 65 countries, which account for about 60 per cent of the world population, 30 per cent of the world gross product, 40 per cent of the world trade, and more than 50 per cent of the global population under the extreme poverty line. The initiative is also open to other countries. Therefore, the efforts to jointly build the “Belt and Road” can significantly push forward the implementation of 2030 Agenda and the achievement of the SDGs not only for the countries along the “Belt and Road” but also for the world as whole.